The massive field of 1,529 players battled down to the final table the remaining players were seething to get their hands on the massive $2.2 million first-place prize. One of the players seated among the final eight players –which included some of online poker’s biggest stars—was a familiar name in the poker world Barry Shulman. Shulman made his way to yet another major tournament’s final table; fresh off his World Series of Poker Europe win a few months ago. Alas, it was not meant to be for the Card Player Magazine CEO, as he finished in a very respectable 3rd place worth $1.35 million. This left 19 year-old Harrison Gimbel and Tyler Reiman to battle it out for first place. Reiman began the contest with a 28,000,000 to 17,000,000 chip-lead, but Gimbel was able to take the upper hand after a monster bluff on the river gave him a 36,000,000 9,000,000 chip advantage. When Gimbel’s pocket Tens held-up against Reiman’s pocket 8’s Gimbel became the youngest PCA champion in history. 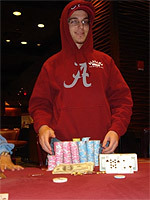 This entry was posted on Tuesday, January 12th, 2010 at 3:36 pm and is filed under Poker News. You can follow any responses to this entry through the RSS 2.0 feed. You can leave a response, or trackback from your own site.